Reading and eating—or “reating,” as I like to call it—is a favorite pastime of mine. And if you can do it while soaking up the sun on the beach, patio, sidewalk cafe or at the pool, so much the better. We’ve all been hearing a lot about the death of print publishing. Well, if the cookbook industry is any barometer, I’d say the future of the printed word looks pretty rosy. Each year seems to bring not just more good books for cooks and food enthusiasts, but better ones. Maybe that’s because in today’s more egalitarian cooking world, it’s not just the Flays and Rays and Pucks that get published. There are some really great food publications and blogs out there, and many of them are showing up in book form. Not every new cookbook is a gem, and part of my job is to sift through the stacks so that you don’t have to. Here are a few selections that would most certainly add flavor to your summer. 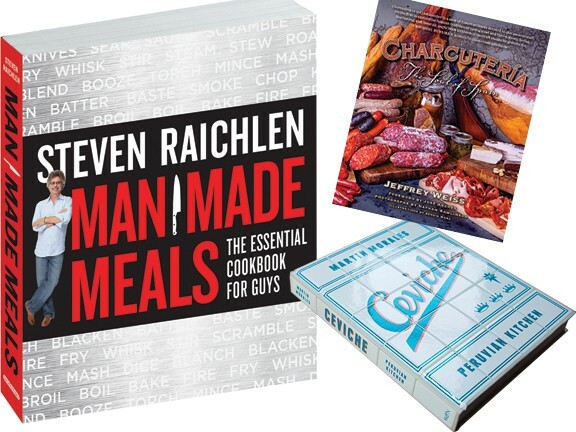 Steven Raichlen is known for his barbecue smarts, and although his latest book—Man Made Meals: The Essential Cookbook for Guys—might sound a bit misogynistic, I’d imagine the title was a PC-challenged marketing person’s idea. Women can buy it, too. The bottom line is that it’s another in a long line of terrific books from Raichlen about smoking, grilling, barbecuing, broiling, roasting, poaching and anything else you can do to food, especially meat. If nothing else, try out the incendiary Fire Eater chicken wings. While we’re on the topic of meat, Jeffrey Weiss’ Charcutería: The Soul of Spain is a bonanza for meat-lovers, but a treasure trove for everyone else, too. The densely packed book weighs more than my KitchenAid mixer and covers more culinary territory than a dozen lesser cookbooks, combined. This very unique book not only introduces Americans to authentic Spanish-style butchering and meat-curing techniques, but also offers more than 100 traditional recipes, plus a detailed history of Spanish charcutería, all accompanied by beautiful photographs. From Spanish chorizo and adobos, to escabeche, embutidos and postres, Weiss has all the bases of Spain’s charcutería tradition covered. For nearly a century, Orwashers bakery on New York’s Upper East Side has been supplying demanding customers with Old World-style artisan breads, including the famous loaf made with wine grape starters, a technique that dates back to Ancient Egypt. In 2007, artisan baker Keith Cohen purchased Orwashers and now he’s sharing the secrets of traditional bread baking in Orwashers Artisan Bread: 100 Years of Techniques and Recipes. You’ll have a ball making your own miche rolls, challah, focaccia, pumpernickel, rye bread, baguettes and more. And Cohen’s precise and easy-to-follow instructions on matters like sourdough starters, proofing dough, fermentation, shaping and many others will help ensure that you’ll be a bodacious baker right off the bat. I followed his baguette recipe and might never have to eat another store-bought baguette. Of course, man cannot live on bread alone. We must also have pâtisserie. Thankfully, William and Suzue Curley have come to the rescue with Patisserie. This is another hefty tome, and flipping through it at first seems a bit daunting. But relax. The authors start out with pâtisserie basics, like custards, creams, syrups and such before getting down to the nitty-gritty of more complex creations such as the Pistachio & Cherry Arctic Roll or the heavenly-looking Cadeaux au Chocolat. Or, you could just head over to Les Madeleines and let pastry chef Romina Rasmussen do the work. After enjoying all those baked goods, pâtisserie, charcutería and such, you’ll probably welcome Michel Guérard’s new book: Eat Well and Stay Slim: The Essential Cuisine Minceur. During the 1970s and early ’80s, Michel Guérard—a three-Michelin-starred chef—was at the forefront of the cuisine minceur movement, which threw out the hearty stews, pressed duck and such for a revolutionary new French cuisine. Portions were small, flavors were vibrant, presentations were artful—and, unfortunately, too much cuisine minceur was just silly. It died—or so I thought—a probably deserved death in the late 1980s, when it was supplanted by the simplicity of French bistro fare. When done right, however, cuisine minceur is still one of my favorite eating and art forms. In Eat Well and Stay Slim, Guérard proves than you can dine like a gourmand and still cut calories. His entree recipes all carry a calorie count of 240 calories or less. Try doing that with steak au poivre and pommes frites. Healthy and wholesome eating are the underpinnings of two more good new cookbooks: The Nourished Kitchen by Jennifer McGruther, and Brassicas: Cooking the World’s Healthiest Vegetables by Laura B. Russell. McGruther’s fine book, subtitled Farm-to-Table Recipes for the Traditional Foods Lifestyle, has a clunky title, but her recipes certainly aren’t. They are a throwback to a time when our ancestors made their own cheeses, yogurt, breads, butter, broths, fermented veggies and such. Dishes like pickled beef tongue with mustard sauce and pan-fried calf’s liver with bacon and onions are two that my granddad would have heartily enjoyed. Who’d have thought Brussels sprouts or kale would become trendy foods? Well, apparently Laura Russell saw Americans leaning toward healthy brassica—a genus of plants in the mustard family—and she’s here to help those of us who are a bit veggie-phobic to understand and enjoy dishes made from foods like cabbage, mustard greens, broccoli, cauliflower, collard greens and many others. I never expected to fall in love with a broccoli and pepper jack frittata, but it happened. Finally, summertime for me means ceviche. This summer, I’ll turn to Martin Morales’ Ceviche: Peruvian Kitchen for his nearly endless array of ceviche preparations, along with other Peruvian specialties such as lomo saltado, tacu tacu and quinoa salad.